Why theater? : Theatre teaches me presence. I have always been the type of person who spends much of the day in her head, anxiously planning or worrying. Theatre has taught me to live in the moment, to listen and to get out of my own way. If I can influence even just one audience member to do the same, then I feel like I've succeeded. Who do you play in The Fall? 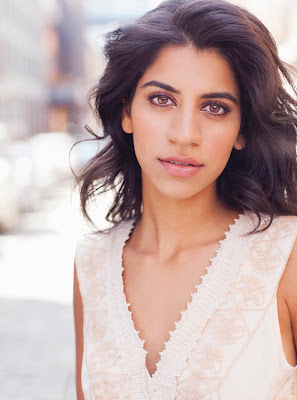 : I play a young Pakistani-American woman named Nasrin. Her father was killed on September 11th; he worked in one of the towers. The play brilliantly addresses Islamophobia via Nasrin's character. Her perspective is from the hundreds of families who suffered loss and had to deal with ignorance and racism on top of it. Nasrin is a leader; she wants to be the change, not just see it. That's what makes her so inspiring to me. Tell us about The Fall: The Fall centers around a group of young women who lost their fathers in the attacks on the World Trade Center on 9/11. It is set fifteen years after the attacks. It explores the ways in which we grieve, cope, recover, love, and find hope, all through the personal recollections of these young women. It does not dwell on the horrors of the attacks. It is about the journey these women take to find that glimmer of strength and joy, which we all have within us. Lilia, our incredible writer, has tapped into these universal human experiences which can be easily related to what is simply going on in the world right now. She originally conceived the play in 2011 with a smaller cast, which I was a part of. Now, it is a larger, ensemble-driven piece. We will be performing less than a month before the fifteen-year anniversary of 9/11. What's it like being a part of The Fall? : It's been one of the best theatre experiences I've ever had. I am in awe every single day of this company. Our writer, Lilia Rubin, and our director, Jane Arnfield, have created a stunningly female-empowering piece. We laugh, we cry, we do tai-chi. They've created an unforgettable experience for me and for audiences everywhere. It's also been really fun to reprise the role of Nasrin 5 years later, 5 years older. What kind of theatre speaks to you? Who or what inspires you as an artist? : I'm inspired by anything that touches upon what we as humans deal with every single day. Love, friendship, sexuality, racism, loss, religion, the duality of life, etc. The rawness of a story is what speaks to me. Less is more. I am also inspired by artists like Lin Manuel Miranda who make an effort to bring more diversity into all forms of entertainment. Any roles you're dying to play? : Marvel's Jessica Jones. Female Sherlock Holmes. I've also always wanted to be Viola in Twelfth Night. What's your favorite showtune? : I have the Hamilton playlist on repeat. Who would play you in a movie about yourself and what would it be called? : "How to be an aspiring artist and simultaneously have a Type A Personality." Claire Danes! If you could go back in time and see one play or musical what would it be? : I heard Disgraced on Broadway was really good. What show have you recommended to your friends? : There is a ton of quality theatre outside the realm of Broadway. Each and every show at the Fringe Festival is unique and entertaining. On TV, however, it would be Sherlock, Breaking Bad, Narcos, Orange is the New Black & anything Shona Rhimes. What's your biggest guilty pleasure? : Pretty Little Liars and gluten free pizza. If you catch me eating and watching at the same time, I've probably never been happier. What's up next? : I'm starting rehearsals for a play on Monday called A Muslim In The Midst, by Anand Rao. It premieres at the Hudson Guild Theatre on September 12. I play a woman named Priya. This play deals with the immediate aftermath of 9/11 as seen through the eyes of ordinary people outside the United States.